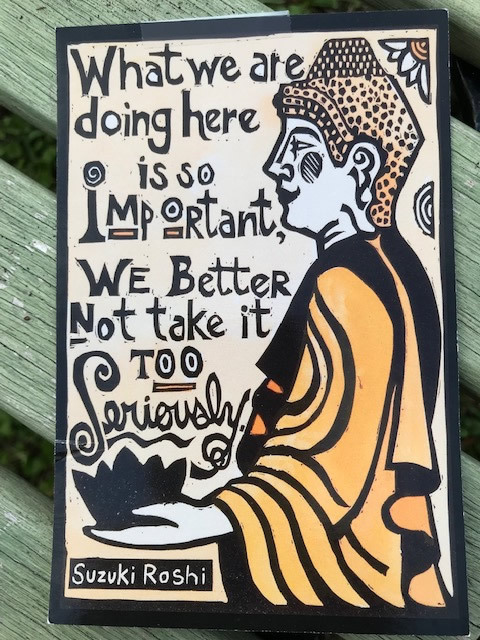 "I confess I’m a little uneasy to see an Issue made of this, as I really have no backup for my “claim” that this charming quip was originally from Aitken Roshi – just a memory that I saw it from him somewhere. And so was surprised to see it credited elsewhere. However, it still does feel more like Aitken than Suzuki, or any other teacher – more like something he, as a native English speaker and American intellectual, would say. Like American rather than Asian humor, in other words. And I feel a kind of loyalty to my dear, old friend (we first met in 1955), that he should get credit where it’s due." Tim Burkett used this statement in his book "Nothing on My Mind" and later said he guess he got it mixed up, that he'd studied with Aitken for a couple of years as well. It's also online attributed to Suzuki in a few places. I'm pretty sure they're wrong, just repeating what they read or were told. 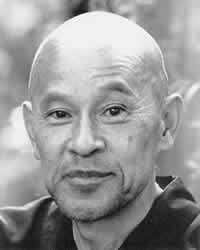 11-21-12 - There is a story about our founder Shunryu Suzuki Roshi answering the phone in the office at City Center. When asked “What time does meditation begin?” He replied, “It never stops!” and hung up the phone. Hunted down the source of this story and the trail petered out like an urban myth. Shainberg said he hadn't heard that story but it did sound like Kyudo. DC opinion: Suzuki Roshi would never have done this. He was never rude to strangers like this and always encouraged people to come to zazen. Check this letter out received by Richard Baker in the seventies. Received an email asking if a Suzuki quote on paradox was fake or not due to an exchange on Facebook Soto Zen page. FACEBOOK again - looking like not a dubious quote, seeking source. 9-22-18 Aaron Erb (great name) posted: Zen friends: if you've heard a version of the following story, I'd like to hear it (maybe it's even in a book?). It may be Katagiri Roshi but I don't know. The Roshi was at Tassajara (perhaps in the dining room) with some students when he pointed out the window: "See those deer on the hill?" A few deer are nibbling grass nearby. "Your life is just like that." Elizabeth Burgess Sawyer I knew both Katagiri and Suzuki but I don't remember who said this....David Reich Chadwick might. I'll quibble a bit: I have watched deer on that steep slope across the creek from inside the dining room. But I also have no doubt that my "version" of this story is only in the spirit of whatever story I heard rather than anything like a quote. David Reich Chadwick - Oh my gosh - you've seen deer over there! I would have thought only mountain goats could be there. Good. Thanks for telling me. Maybe this is not a dubious quote. Now it's becoming a good story. Kōgen Dito-Keith Aaron Erb I too watched many an intrepid deer on that "hill" side. Aaron Erb Kōgen they're remarkable! Now I remember seeing them there too, have been awakened by this exchange, was blind and now can see. It would be nice to know the source but it's good no matter who said it..
8-07-13 - Thanks to John Waggoner for this generous offer relating to the post of 8-05-13: I never met Shunryu Suzuki, so if you need someone to come up with spurious stories about him to archive on Cuke just let me know. Once while playing the banjo, Suzuki-roshi leaned over to me and said, "you know, crosspicking is a road to enlightenment." Once while sitting around the campfire roasting marshmallows, someone said, "Roshi, what is the cost of an angry or hateful thought?" His answer was instantaneous: "If you have to ask, you can't afford it."